Use this activity to teach your students about Native American culture. 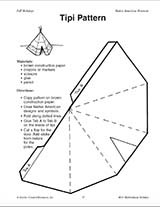 The worksheet provides students a list of directions and materials they need in order to create their own tipi. Extend the activity to have students complement their creation of the tipi with a summary of what they learned.